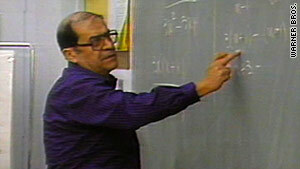 Jaime Escalante turned the failing calculus program at Garfield High into one of the nation's best. Escalante was portrayed by actor Edward James Olmos in the 1988 film "Stand and Deliver"
Los Angeles, California (CNN) -- Jaime Escalante, the math teacher portrayed in the 1988 film "Stand and Deliver," died Tuesday after a battle with cancer, according to the actor who played him. Escalante, 79, was surrounded by his wife, children and grandchildren when he died at his home in Roseville, California, said Edward James Olmos. Olmos visited Escalante's bedside Monday night, he said. "We lost one of the true giants of education and inspiration in this country," Olmos said. "He really made us understand that it didn't matter what color, race, creed or ethnicity any of us are." Olmos disclosed earlier this month that Escalante was "seriously ill" with cancer and needed help paying for his medical care. He held a fundraiser in Los Angeles, California, for him last week. "Stand and Deliver" told the inspirational story of how Escalante turned the failing calculus program at Garfield High School in east Los Angeles into one of the top in the nation. The movie depicted events of 1982 when his inner-city student's test scores were questioned by officials. Those who were retested had their passing scores reinstated. Escalante became a hero for educators, earning him entrance to the National Teachers Hall of Fame and the Presidential Medal for Excellence in Education. "During his tenure at Garfield High School, many of our students excelled in learning, aspired to a higher education and went on to become very successful in various careers," Los Angeles School Superintendent Ramon Cortines said. "Today, they are living testaments to a teacher who demonstrated how high expectations coupled with constant support can overcome obstacles to a quality education." The Garfield High math program floundered after Escalante left in 1991 for a teaching job in Sacramento, California. He also hosted a PBS television series that promoted math and science careers. He retired from teaching and returned to Bolivia in 1999, where he was born in 1930. Escalante recently returned to California for medical treatment.